What started out as an online bookstore is now not only the largest online retailer but also the company to beat in the digital world. Amazon is building a river of digital services across the industry board including retail, music, entertainment, movies, mobile applications, storage and e-commerce. Amazon CEO Jeff Bezos has shown no hesitation to enter a new industry. That makes Amazon an exciting company to follow and, from a competitor’s standpoint, one to be afraid of. With the Amazon Kindle, Audible.com, Amazon mp3, the Amazon App Store, Amazon Instant Video with Amazon Prime, the recently announced Amazon Cloud Player, and, of course, Amazon.com itself, the company is becoming a go-to source for online shopping and entertainment. I’ve been testing out the Amazon Cloud since last week and, so far, I’m very impressed. A simple (and free) download is all that’s required to get started. Then just upload your media files. I’ve found the music storage alone to be well worth the download. The Cloud lets you access your music on any computer or any android device. So I was able to delete music files from my Droid, freeing up much needed space. With the free version of the Amazon Cloud Drive and Player, you’ll get 5GB of free storage. For more, you’ll have to pay. Though right now I have 299 songs on my Cloud and I’m using only 1.3 GB of storage, 26% of the alloted 5 GB. By the way, what is a “Cloud”? A Cloud is basically a hard drive in the sky, a hard drive on the internet that users can access from any computer, or compatible mobile device, with an internet connection without hauling anything around. In a way, your email service is like a cloud. Gmail serves as a cloud for your email by storing your messages on the web and thus being accessible from many devices with an internet connection. The Cloud lets you store Music, Documents, Pictures and Videos. Whether it was purchased from Amazon or not. 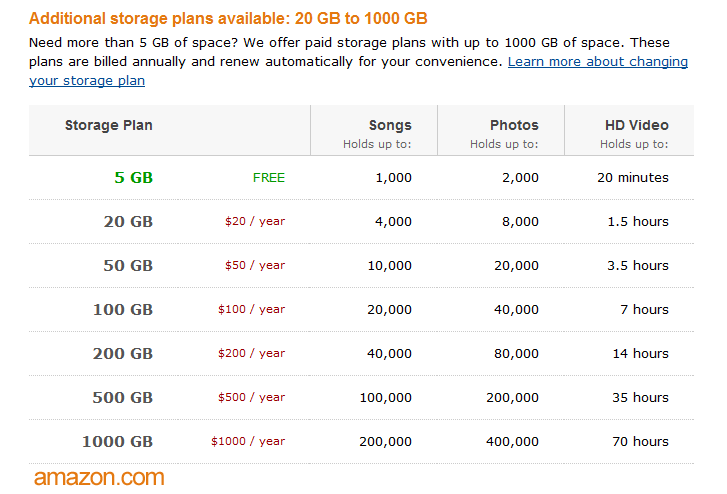 Here’s a breakdown of the additional storage plans, up to 1000 GB of space. For more on the Amazon Cloud, click here. Amazon Prime membership offers users on Amazon.com unlimited free two-day shipping for $79 per year, billed annually. That was until Amazon announced in February that Prime users would also have access to unlimited, commercial-free instant streaming of 5,000 movies and TV shows. Amazon Instant Video offers little differentiation from Netflix with a smaller library but the bonus of free two-day shipping. Though Amazon claims 5,000 titles are available, I’m only able to see around 3,000 titles including TV and movies. I’ll keep checking on this. Free shipping and a library of videos to stream instantly to your computer or TV for about $7 per month is a solid deal, especially for frequent amazon.com shoppers. Price compares to Netflix, though Big Red is billed monthly. Netflix offers an unlimited streaming plan (though no discs by mail) for $7.99 per month. Your favorite books. On audio. I’ve tested this out, too, though I haven’t committed just yet. I enjoyed my free two-week trial period, downloaded a couple of audiobooks. The service also offers magazines, radio shows, podcasts, stand-up comedy and speeches. How it works: Audible.com offers two plans: Gold and Platinum. With either subscription, you receive credits that can be used to purchase audiobooks or other audio content. Both plans have a monthly and annual option. Audio files purchased from Audible.com can be accessed from your computer, burnt to a CD, played with the Audible.com app, as well as iPod and more than 500 other devices per Audible.com. For a list of compatible devices, click here (you may have to navigate to the “comaptible devices” window). In December of 2010, Amazon made a $175 million investment in local-deals site LivingSocial. The service operates much in the same way as Groupon, offering heavily discounted items and services. LivingSocial does things a little differently, however. Whereas Groupon requires a specific number of people to buy a deal for it to be valid, LivingSocial makes it easy. Buy the deal and it’s yours. But LivingSocial adds another layer to the daily deal. Once you buy a deal on LivingSocial, you’ll receive a unique, sharable link. Your deal becomes free when three people buy the deal from your unique link, giving you extra incentive to share the deal. Both Groupon and LivingSocial offer mobile apps to get deals on the go. Prior to its investment in LivingSocial, in June of 2010, Amazon acquired deal-a-day site Woot. Woot Services, LLC is actually a bunch of sites under one wootbrella. There’s the main Woot.com, which operates like Groupon and LivingSocial, offering one deal a day from a variety of sources and services. But its sub-sites offer specific products, like T-Shirts on shirt.woot.com; or kids products on kids.woot.com; or wine on, you guessed it, wine.woot.com; and more. “We think now is the right time to join with Amazon because, quite simply, every company that becomes a subsidiary gets two free downloads until the end of July, and we very much need that new thing with Trent Reznor’s wife on our iPods,” Rutledge wrote in a letter to Woot employees on June 30, 2010. So that’s Woot for you, a site that’s 50% humor and entertainment and 50% great deals. It’s worth a look. If nothing else, you can buy a Woot Shirt. Sound familiar? Besides the obvious Netflix similarities, it’s essentially what Amazon just rolled out as a bonus to its Amazon Prime membership. Minus the discs by mail. But, hey, I wouldn’t be surprised if Amazon started renting discs by mail. What better a way to make money from older movies nobody wants to buy from Amazon.com? Rent them through Amazon.com. Amazon has had ownership stake of LoveFilm since 2008, but it wasn’t until January of this year that Amazon took full control of the company. And in February, Amazon announced its Amazon Prime members would have access to Instant Video content, streamed to their PC or a number of TV-connected devices. Could LoveFilm set up shop in the U.S.? Former LoveFilm COO William Reeve thought it could compete with Netflix, but reportedly didn’t receive the backing from LoveFilm venture capitalists. Reeve left LoveFilm in 2008, before Amazon was a part of the plan. Now that Amazon’s in full control, would it bring LoveFilm over and risk competing with, well, itself? Amazon is claiming stake in every conceivable digital media category. Including rumors within the last two days of an NFC-based mobile payment service. (NFC stands for Near Field Communication, a short-rage wireless service that allows NFC-equipped cell phones to pay for items at brick-and-motor stores without a debit or credit card, just using a phone.) The NFC tech talk is just another way Amazon is moving with technology and moving in on competitors. Smart business strategy by CEO Jeff Bezos. I’d watch for more acquisitions. Amazon’s made a habit of acquiring companies and rolling them into Amazon’s umbrella of services. Amazon reported net sales of more than $34 billion in 2010 (up from 24.51 in 2009) and net income of $1.15 billion. International sales, representing Amazon’s UK, German, Japanese, French, Chinese and Italian services were $5.74 billion, according to the company’s financial statements, up 26% from fourth quarter 2009. Two sectors where I predict growth for Amazon in 2011: Social Networking and Instant Video. Just putting pieces of this Amazonian puzzle together: Amazon Prime members, Audible.com, Mobile, Instant Video and a growing list of services. Watch for Amazon to roll out a social network of sorts, not a Facebook competitor by any means maybe just a mobile or TV hub that connects all Amazon members (and its subsidiaries). You’d be able to see what your friends are watching instantly, or what items they’ve rated on Amazon.com, What they’re listening to from Audible.com (opt-in, of course). In June of 2010, The United States Patent and Trademark Office awarded Amazon with a patent for a social networking system, the one it filed for in 2008. I don’t see them sticking with the PlanetAll title if it’s re-introduced. I imagine they’ll roll it into the Amazon name and connect it with all of Amazon’s services and subsidiaries. The trademark office lists the Inventors of this patent as Brian Robertson and Warren Adams, the founders of PlanetAll. I’d watch for Amazon Instant Video to bulk up its offerings. I’m going to keep an eye on LoveFilm. LoveFilm is similar to Netflix in operation, pricing and even layout and iconic red packaging. With one key difference. In LoveFilm’s £14.99 plan (about $24), the service offers unlimited Movies, TV and Video Games by mail. A comparison here would be pairing Gamefly with Netflix. I’d love for Amazon to incorporate this into its Amazon Prime membership, as part of new tiered membership options. One final prediction: How about Amazon selling streaming devices, possibly through acquiring a company that makes them? Amazon could then sell the box at a discount with an Amazon Prime membership or even give it away with an annual membership to Amazon Prime. If Amazon’s history is any indication of its future, watch for the company to continue expanding its services, moving into new industries and increasing its user base. I have been without cable TV service since April of 2010. One of the so-called TV cord cutters. So for you, I’ll share my view (from the future perhaps). Here I’ve compiled a guide for those of us brave enough to live life without cable. In both written form and a chart for easier comparison. Note: due to the complexity of these devices and the many different options, levels and subscription plans, some of this information may vary. For example, Xbox 360 requires no monthly subscription. But to access certain features, like its ESPN Internet App, an Xbox Live Gold Membership (roughly $3/mo.) is required. Additionally, Netflix starts at $7.99 for streaming-only, but an additional $7.99 for DVDs by mail, which I included below. I’m also focusing my guide on external devices, per se, and not TV sets that now have some of these offerings built-in, including wireless internet connectivity. And now, a guide to Internet TV by Eric Zimmett. This guide is not meant to be a complete list of Internet TV services, but rather an overview of some of the best devices and services on the market. It does not include Internet-connected television sets, only external devices. As more services become available, and as current services change, this guide will be updated. CATEGORIES EXPLAINED: Unit Cost notes the cost of the device upfront, if there is one. Subscription lists the monthly cost to use the service. In some cases, it was an annual subscription. In those cases, I divided by 12 (thanks Math 004!) to put everything on a level playing field. Netflix notes whether or not the service has access to Netflix. A subscription to Netflix is still required. Hulu Plus notes whether or not the service has access to Hulu Plus. A subscription to Hulu Plus is still required. I-Net Videos refers to internet video found throughout the web like cbs.com, espn.com, etc and whether or not the device has free access to those videos. I-Net Apps notes whether or not the device includes its own set of internet apps like Break.com, Facebook, Twitter, USA Today, CNN, etc. Internet apps vary by device. Blu-ray Player notes whether the device plays Blu-ray discs. Rentals shows whether or not the service offers DVDs or Blu-ray discs by mail. Pay-per-view tells whether the service offers movies or TV shows on a per view basis instead versus by-subscription. And now, the details…and “my take” on each. Users pay monthly for the Nextlix service, with a number of pricing options, starting at $7.99 for streaming-only, $7.99 for DVDs by mail. Netflix offers the largest catalogue of moves and a growing list of TV shows. No minimum contract length. No early cancelation fees. My take: If you are going to go with only one subscription service, Netflix is it. The largest library, the best quality streaming plus DVD and Blu-ray by mail. Netflix has it figured out. Users pay monthly for the Hulu Plus service. Cost is $7.99 per month. Hulu Plus offers the largest selection of TV shows and current season of TV shows. No minimum contract length. No early cancelation fees. My take: If you are a Netflix subscriber, Hulu Plus is the perfect complement, offering you the new content, the current season that you don’t get with Netflix. Not nearly the quantity and streaming quality of Netflix, but Hulu is a great service. Amazon Instant Video requires a subscription to Amazon Prime, which at first included only free 2-day shipping from Amazon.com. Amazon now lists Amazon Instant Video “free” with Amazon Prime membership. But since this isn’t a guide for the best free-shipping methods, Amazon Instant Video is about $7 per month (the price for Amazon Prime membership). My take: Amazon Instant Video offers many of the same titles as Netflix (just not nearly as many). So if you’ve got Netflix, there’s no reason at the moment, other than free two-day shipping, to get Amazon Instant Video. One of the pricier options for streaming video, starting around $300. Sony and Logitech each make a box that when connected to your TV will open you up to the library of videos on the internet in addition to Netflix and Hulu Plus. When your set is hooked up to Google TV, the service creates a special page for every TV series, i.e. Men of a Certain Age, which lets you quickly watch any episode whether it’s on the web or cable (if you have a cable subscription). Note: Google TV also comes built-in to certain TV sets, but we’re focusing this report on external devices. My take: Google TV’s biggest strength is merging Internet TV and Cable TV into a complete video experience. Since I am without cable, Google TV doesn’t really do it for me. But if you’re looking to get the best of both worlds, Google TV is definitely worth a look. Boxee Box by D-Link is a nice player. Like Google TV, it connects your TV to the internet and all the videos that come with it. In addition to Netflix, Hulu Plus, Amazon VOD, etc. My take: Boxee is a major contender in my mind (and in the running to be my next player). Boxee is clearly trying to set itself apart from the competition. Clever name. Clever box (check it out if you haven’t seen it). And a lot of great content. A couple noteworthy features: Boxee comes with a remote control with a QWERTY keyboard on the back, perfect for searching for a particular show or movie without having to navigate to each character with a remote control. Another advanced feature is Facebook sync (plus Twitter and Boxee Network), which displays what you and your friends are watching, allowing recommendations, etc. A little creepy, yes. But I believe this is an opt-in feature. PlayOn is a cheap alternative to Boxee Box, Orb and Roku, connecting your TV to the internet through an external device like a Blu-ray player or video-game console – which gives you access to internet video from CBS, Comedy Central, TBS, Adult Swim, Spike TV, ESPN, CNN, PBS, Cartoon Network, YouTube, MTV, Pandora, Vevo, Revision3, SyFy, Food Network, TED and more, in addition to Netflix and Hulu Plus. PlayOn is a little more complex in that you have to download an application to your computer, then run the application and sync it with your compatible Wi-Fi device (PS3, Blu-ray, etc). My take: I just picked up my subscription to PlayOn (free 14-day trial, about $3 per month thereafter) and I love it. Streaming quality depends very much on your connection speed, but for the price, you can’t beat the content it offers. It takes some know-how, as it requires not only a separate device to stream (PS3, Xbox 360, Wii, etc) but also a computer and Wi-Fi network. But for the money, it offers great internet content to your TV. Some people refer to all streaming video as VOD (video-on-demand) but I try to differentiate it from subscription-based unlimited streaming. VOD lets you rent or purchase movies (per title). Vudu is available on a number of devices including Blu-ray players, Video-game systems, and all the Boxees, Orbs and Rokus out there. My take: Today’s Pay-Per-View. I’ve rented movies a few times. The service is easy to use, quality was good, depends again on your connection speed. Prices, however, were average, $3.99 per rental for SD quality, $4.99 for HD on most titles. Similar to Vudu and Amazon Video On-Demand, available on a number of devices including Blu-ray players, Video-game systems, and all the Boxees, Orbs and Rokus out there. Blockbuster is trying to save itself by moving into the internet streaming biz. There’s just about 10 years too late. NEW: Blockbuster was acquired by Dish Network in April of 2011. In September, the company introduced Blockbuster Movie Pass. First touted as a Netflix-killer, the official news was less than impressive. This service is now an add-on to a Dish Network subscription for an additional $10 per month. Big disappointment from the Dish/Blockbuster acquisition pairing. My take: Have not tried Blockbuster On-Demand or Blockbuster Movie Pass. But I don’t think I’m missing anything. Similar to Vudu and Blockbuster On-Demand. Amazon VOD is available on a number of devices including Blu-ray players, Video-game systems, and all the Boxees, Orbs and Rokus out there. Amazon’s extended its services to the video realm. In addition to buying DVDs or Blu-ray discs on Amazon.com, you’re now able to stream videos instantly. My take: Amazon could have something here. If it’s able to compete with Netflix and Hulu Plus with content, Amazon will be a contender. Upper-level Blu-ray players allow you to connect to the internet, often wirelessly, and stream video content from a variety of sources. Each company also has its own set of Internet Apps, including Netflix and Hulu Plus. Before buying a Blu-ray player, make sure it is able to connect to the Internet and access streaming video as not all players have this capability. My take: I’ve got a Sony BDP-S570 Blu-ray Player. Blu-ray quality is excellent. Plus I can wirelessly stream movies, music and podcasts. Including Netflix and Hulu Plus (subscription required for those) as well as a selection of Sony Internet apps like YouTube, Blip.tv, Crackle, Dr. Oz, WIRED, Daily Motion, eHow.com and more, free. My take: Samsung is leading the way in the internet apps game, particularly with its Internet@TV. The company is really ahead of the curve (just introduced a Wi-Fi connected refrigerator with Pandora). Watch for more great things from Samsung. My take: Vizio players are usually lower in price than other models, like their TV sets, and they offer some quality apps. Vizio internet apps (via) include Netflix, Hulu Plus, Blockbuster, Amazon VOD, NBA Game Time, Flickr, Pandora, Rhapsody, Vudu, Twitter, Yahoo and eBay. Apple TV just redesigned its little black box (smaller, more portable?) but it still packs a big punch. Apple TV will get you Netflix and a few VOD options (pay-per-view) and YouTube, Mobile Me, and Flickr. The device also lets you sling media from an iPad to your TV. My take: Like all Apple products, this thing is slick. Navigation and quality is smooth and top-notch. Recommended for Apple fans or anyone looking to add Netflix to the home and isn’t swayed by Roku’s large library of Internet video. Orb is slightly more sophisticated than a few of the players in this guide, but that also means it’s more complicated. Orb connects you with the Internet’s library of video content, Netflix and Hulu streaming plus Sirius XM Radio but requires a little help from your computer (like PlayOn). My take: Orb is a little more complicated than other devices, but offers some nice features. Comparable to PlayOn, just more advanced with a better interface and more features. FOR MY POST ON ROKU, CLICK HERE. No PC needed here. Roku is as simple as it gets. Like many players in this guide it connects wirelessly to your network. And Roku starts at just $59.99. Roku also offers one of the finer collection of Internet apps including: Netflix, Hulu Plus, Amazon Instant Video, Pandora, Roku Newscaster, CNet, Blip.tv, Break.com, Crackle, Facebook Photos, Flickr, Last.fm, NASA, Picasa, Revision3, TuneIn Radio and, actually, a ton of other applications. Roku is the most advanced player I’ve used, incorporating premium channels like Netflix and Hulu Plus with free content from Break.com, Crackle and Newscaster. Newscaster displays up-to-date video content from the major news networks. FOX News, ABC, CBS, NBC, CNN, PBS and more. One such source, Al Jazeera, even streams live in the mornings. News 3, Channel 3000, is a local news channel in Wisconsin. It is the first local news channel offered through the internet and into your living room. My take: For anyone even considering ditching the cable box, Roku is a must. Roku is one of the least expensive options for streaming video and video-on-demand, with its first player starting at $59.99. Roku just released the Roku 2 line but I’m partial to the last release. Playstation 3 is the ultimate home entertainment system, built-in wireless connectivity, Blu-ray player and gaming. My take: The PS3 is a great Blu-ray player and one of the best Netflix players on the market. Users can also upload their own videos, music and pictures to the system for easy viewing on a TV. Xbox 360 does probably the best job of incorporating video-on-demand. Great video-game console able to connect wirelessly to Netflix or Hulu Plus. Xbox also features its own small line of Internet apps including ESPN3 that come with its Xbox Live Gold subscription. ESPN3 on Xbox 360 is exceptional, featuring a ton of sports content updated daily. More on this Xbox news soon…. My take: Xbox Rocks. The new content on the way is only going to make it more a home entertainment system. Though some content will require a pay-TV subscription. Xbox Live Gold Membership is required to gain access to ESPN3 but some apps are free. Kinect also offers another way to control some of these apps including Netflix. Though connect, users can navigate Netflix with hand gestures and voice commands. Video-game console able to connect to Netflix. Wii is the only video-game system on the market that does not support HD video, making the quality the lowest of the bunch. My take: Wii is lagging behind a bit in the streaming game, with access to Netflix but still no Hulu Plus. Wii is now the only system with no Hulu Plus support. Netflix browsing on Wii is a little awkward, not quite as streamlined as Playstation 3. Though a recent update made this experience much better. *I have personally used the services or devices noted in this report (and marked with an asterisk). When will PS3, Xbox, Wii incorporate Internet TV? Netflix and Hulu Plus have both taken advantage of the internet connectivity of videogame systems — Sony’s Playstation 3, Microsoft’s Xbox 360 and the Nintendo Wii (still waiting on Hulu for Wii) — when it comes to streaming video content on our TV’s. But when will Sony, Microsoft and Nintendo enter the game themselves? Doing so would offer another bit of differentiation, another perk for owners of each console. It might also further shift the demographics from what was once a teen obsession – playing videogames – to what is becoming a family pastime. Of the current generation of systems, more than 162 million units have been sold. But neither is personally taking advantage of its online content or users. Playstation has a subscription service, called “Playstation Plus” that offers game discounts, game demos and free offerings; but no streaming movies or tv episodes. There are options to purchase such episodes, like “A Colbert Christmas,” a special for the Holidays at $6.99. Colbert dubs it as the “Greatest Gift of All.” That’s about as VOD as it gets for PS3. So Playstation obviously has a desire to attract monthly subscribers. That is the point to its Playstation Plus. One year will cost you $49.99, or you can try a three-month subscription for $17.99. That works out to a little over $4 per month for the one-year plan. With both Netflix (for the streaming-only option) and Hulu Plus at $7.99 per month, if Sony were to include streaming videos its Playstation One membership, I’d have to believe more owners would take advantage. To this point, Playstation, Xbox and Wii have been sitting on the sidelines, watching other services take advantage of their systems. Fight back, I say! Game on! Xbox 360 has a subscription plan as well, two tiers actually, in the same price line as Playstation Plus. Xbox is doing a better job with streaming features, as part of their plan includes ESPN content, streamed to your TV. I have a Playstation 3 and a Wii in my household, but no Xbox. I also have a Sony Blu-ray Player. And my Roku Digital Video Player is on the way. Before we see PS3, Wii or Xbox 360 offering streaming movies or TV episodes, watch for systems to develop internet applications or apps. How about Sony, Microsoft or Nintendo apps, available via free download? That’s probably the first move for any system. Sony already has apps on its line of Blu-ray Players (free with purchase), as do every other manufacturer of Blu-ray or Media Players. I won’t even get into those… GoogleTV, Roku, Boxee Box, Sony, Vizio…all have their own set of internet “apps” like Fandango, Amazon Video on-demand, Rhapsody, WikiTV, Vudu, Pandora, Twitter, Facebook, Flickr, Revision 3, the Weather Channel or Yahoo News, Sports, Weather (a sample of Vizio Internet Apps). Or take Roku, which offers many of the same apps as Vizio, but adds NHL, MLB, UFC, Mp3 Tunes, Break.com, NASA, Flixster. My point is, each media player is offering its own set of internet apps, all free with the purchase of a player. Why not offer these on the consoles themselves? Playstation Apps, Xbox Apps, Wii Apps… Nintendo’s Wii has a version of this, which it calls “Channels” on the main screen. (As far as I’m aware, the Wii Channels have remained relatively the same since their launch.) Xbox has its ESPN internet app/channel. But this is as close as any are getting to developing their own applications. In addition to Movies and TV shows, these systems could offer rentals of their own games, possibly within the same subscription plan or on a tiered plan. That would merge these two successful methods of video and game rentals: Netflix and Gamefly. Gamefly is a game-rental service, currently available only by mail, no on demand. But the vidoegame systems are already capable of game downloads via the internet. You can purchase full games or game demos without a disc. To be fair, Blockbuster recently announced a change to its by-mail rental service: they are now offering movies and games by mail. If Sony, Microsoft and Nintendo are do this, the time is now. By implementing streaming video and/or Internet apps and possibly Games on Demand (GOD?) to boot, they’d have a great shot at competing with services like Netflix and Hulu Plus on their consoles, and could really take a chunk out of game services like Gamefly and Blockbuster. It’s been clear since Xbox (the first go-around) that videogame systems are attempting to become not only a source of gaming, but a part of our entire home entertainment system. Implementing Internet TV is the next logical move. Who will be the first to fully embrace streaming content or Internet apps? Because it’s going to happen, and whichever is the first to act will only begin the next trend in video games and possibly home entertainment as we know it. Messages to Microsoft’s PR firm Waggener Edstrom were not returned by press time. Sony Computer Entertainment US R&D could not be reached for comment. And Nintendo Communications PR, well, didn’t answer our phone call. UPDATE: Amazon has announced that its Amazon Prime membership (a little over $3/month for free 2-day shipping) will now include a library of TV shows to stream to your TV.